This post is sponsored by PetSmart, and the BlogPaws Professional Pet Blogger Network. I am being compensated for helping spread the word about Dental Health Month, but I, Carma Poodale, only shares information I feel is relevant to my readers. PetSmart is not responsible for the content of this article. It's February and that means its National Pet Dental Month.A fact about dental health is that over 80% of dogs and 70% of cats will show signs of dental diseases by the age of 3! Many people don't think about their pets dental health. I got a good checkup last vet visit but the vet said that with me being 9 yrs old now that I should have a professional cleaning at least yearly. I will be having my pearly whites cleaned this month. Until then I will keep my teeth as clean as I can by having my nightly chew. I have been a very good girl except for one day when I didn't want to eat my dinner. Ma won that fight. *shakes paw in the air* She forgave me and we went to Petsmart® to get our food for the week. Ma told me that it was my turn to pick the nightly chews since Scooby got to pick the last one. I need something that is chewy, long lasting and satisfies Ma's want to clean my teeth. I had already made up my mind but ma had to point to each chew until I stood up and wagged my tail. What did I choose??? I chose the New Milk-Bone® Brushing Chews™. I love these chews. They look like a toothbrush that has a little twist to it. They are fun to eat. I have to admit that I took the extra time picking out my chews because of the attention that I receive from the PetSmart staff. Ma approves the Milk-Bone chews because they are VOHC (Veterinary Oral Health Council) accepted. The Milk-Bone chews help to control tartar, they can also help to reduce up to 80% of the tartar that is there. The nubs and ridges are designed to be like bristles of a toothbrush. The box reminds me of Ma's toothbrush box too. Scooby Doo likes these chews too but he prefers the mini's so Ma put the big box back and got 2 boxes of the Small/Medium and 1 Mini. That is what is so great about the Milk-Bone Brushing Chews is they come in 2 different sizes!! PetSmart Vision is to provide Total Lifetime CareSM for every pet, every parent, every time—which we do by offering superior products, unmatched services and superb customer service to pet parents and their pets. I know that at 7pm each night that I will get my Milk-Bone Brushing Chew to help to fight that tartar and keep my gums and teeth healthy. Even my vet says that for a 9 yr old poodle, I have wonderful teeth. I have a little tartar but nothing a professional cleaning won't treat. I also love chewing on the Milk-Bone brushing chew. Those twist and nubs make them fun to eat. 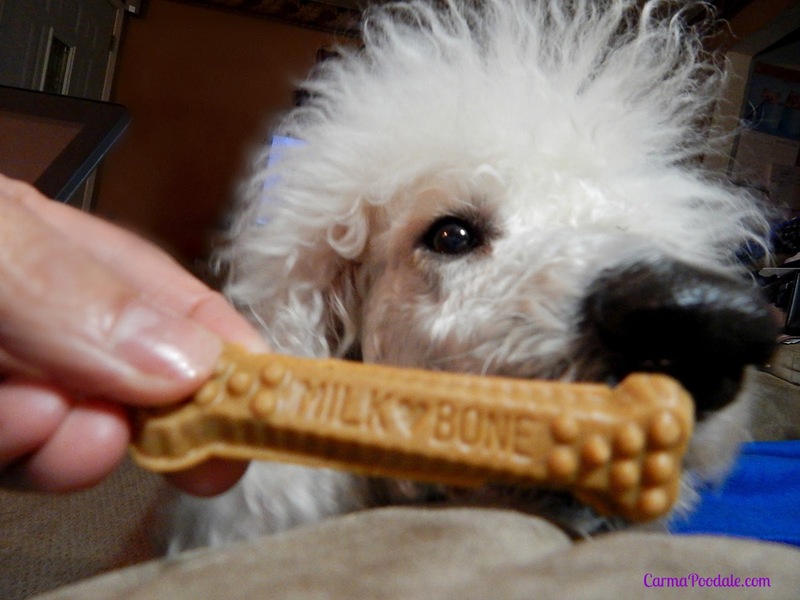 I am a very picky poodle and Milk-Bone brushing chews gets my Poodle Stamp of Approval! You can find a wide selection of chews to fit any dogs or cats taste at PetSmart. Want to see what they have available? Here is a link to all the dental chews. 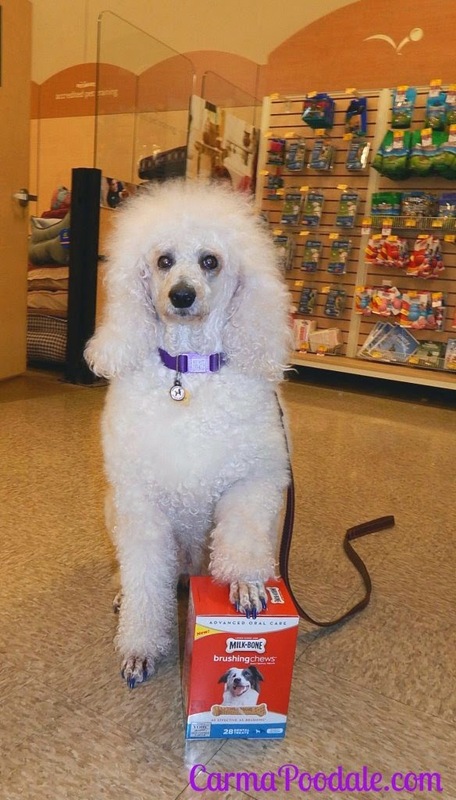 Visit Milk-Bone to find out more about their products and stay connected to get coupons, specials, the latest news. You can share photos of your pets enjoying their products on their social media channels. Now if you excuse me, I need to finish brushing my teeth with my Milk-Bone brushing chew. Join @BlogPaws February 3, 2015 from 8 – 10 pm Eastern as we kick off Pet Dental Health Month with@PetSmart chatting about why prevention of dental disease in our pets is so important. Be sure to use the hashtag #Blogpawschat. I just wish they made a large or jumbo size. Nice review Carma Poodale! 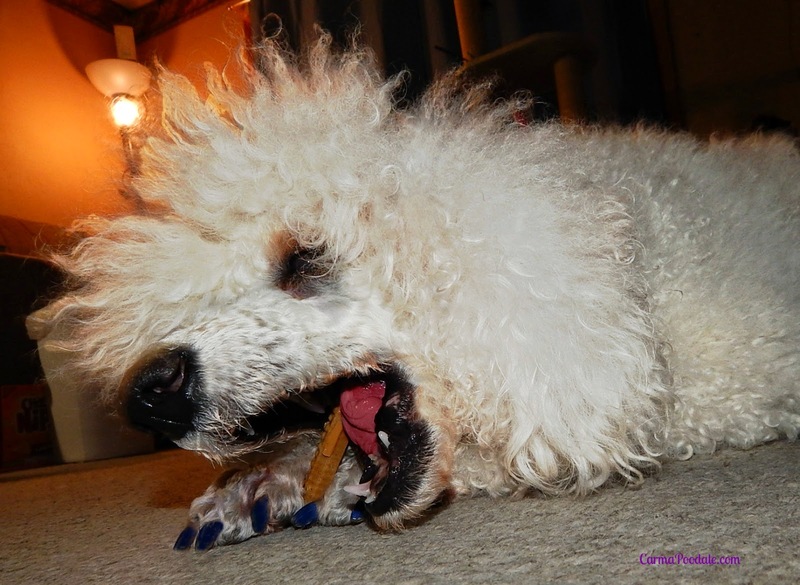 We tested out BLUE bones....regardless of your brand, they are great choices between brushing! I don't think I have ever tried Blue bones. I look forward to reading your review. I hope to keep them nice and healthy. So many of my friends have had to have teeth removed and they said it was a scary thing but their mouths feel better now. Wow, Carma! You are concentrating so hard on choosing the right dental treat! I went to my PetSmart with Ma and you know I was completely distracted by all the other dogs (and smells and sounds...BOL). I am glad you keep your pearly whites as white as your wonderful furs. 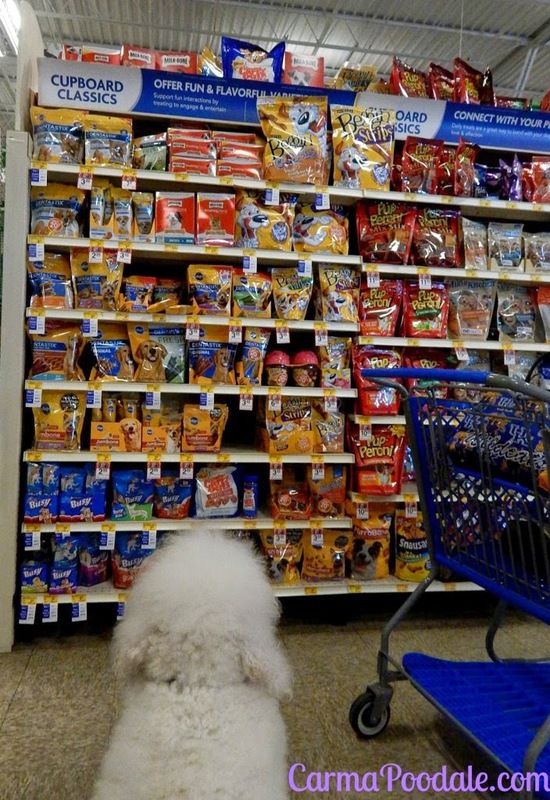 I didn't want ma to pick out the treats so I had to find what I wanted. BOL! I’ll be at rhe chat! I keep my pearly whites clean by biting the humans. TW is trying to distract me with treats. Nice seeing you on the chat! 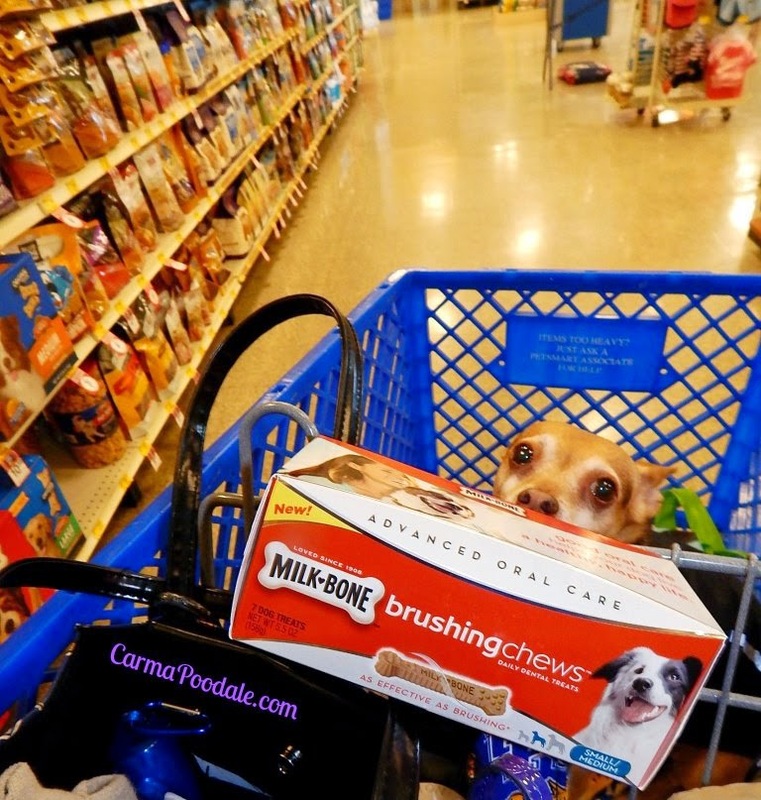 It looks like you had an awesome time shopping for your favorite chews! 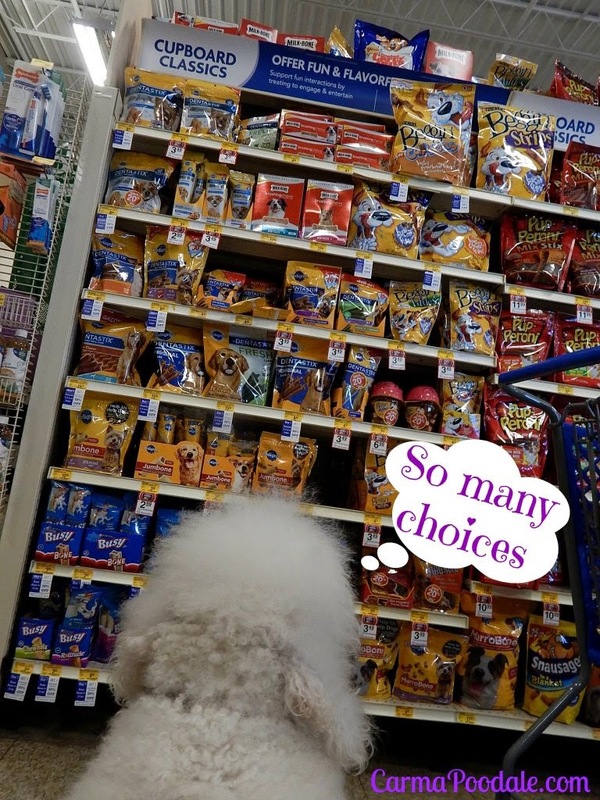 We have a hard time deciding as Petsmart does have quite a selection of great dental chews! Thanks Carma! The facts about dental health are shocking! Glad you are taking care of your teeth Carma! It's so important to pay attention to your teeth! Sampson and Delilah are raw fed so the bones they chomp keep their teeth nice and clean and they both had cleanings last year, but if you don't get a lot of bones, these are a nice alternative. Sometimes it takes time to make smart choices, Carma. It looks like you made a good one and good dental health is super important. Delia hasn't tried these yet, but they are on our list now. Thanks for all of the great info! What an excellent choice Carma!! That is what my baby picked too! You've made a smart choice, Carma! Check out our review of BLUE Bones—that's what I picked! Ha, ha. That picture of Scooby in the cart is priceless! Glad to see the Milkbone dental chews because I was wondering if and how they differed from their regular crunchy treats.